We own camper trailers and we go camping for access to the great outdoors. Let me paint you a picture: sitting by a campfire at dawn, with the mist still rising from the river nearby as the first flames lick up through the kindling. The warmth of a fresh cup of tea (or coffee) soaking into your hands and bringing them to life. Munching on brunch fresh from the outside kitchen. Watching the kids run enthusiastically past you as they burn up energy and engage with the world in a totally non-digital way. Or inhaling the smell from a camp oven as a roast sizzles towards perfection. It just can’t be beaten by the niceties of home life. But what happens when it’s cold, or wet, or windy? That’s when Mother Nature drives us indoors. You’re still camping and it’s still the total escape from the day-to-day drudgery of urban existence, but your canvas space capsule is carrying you to another reality. Camper trailers have come a long way in the past 20 years. Once they were simply what the name suggests: box trailers with a bed on top and room underneath to carry all the bits and bobs that you would otherwise have jammed into the boot and onto the roof racks and under the kids’ feet and then had to unload while you were pitching the tent. With a camper trailer you had room to carry more stuff and your set-ups and pack-ups were a piece of cake. And there was room in the car. It meant you could travel further afield, to see those places that were really at the end of your dream trails. The bucket-list destinations became a reality, long before retirement and without a huge bank account. You could roll into a campsite for the night, be established within 30 minutes, have a meal prepared soon after and then be up and gone at a reasonable hour in the morning to repeat the process in 24-hour cycles. 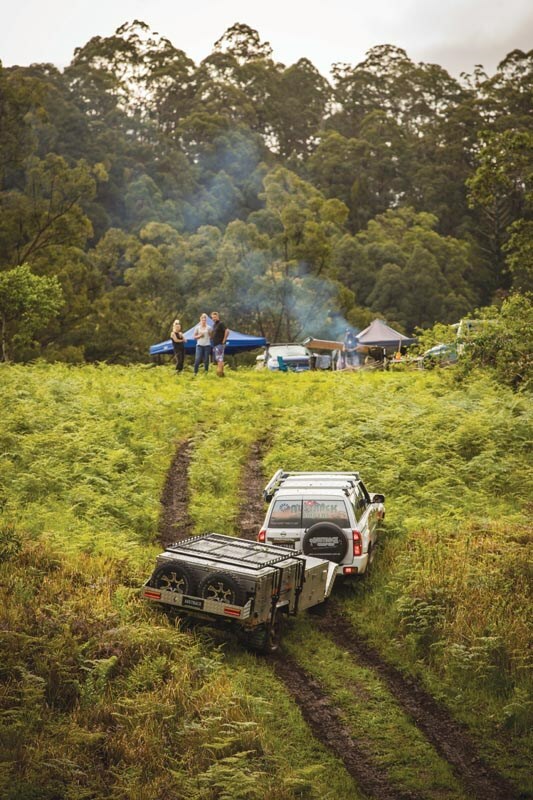 Over three or four days you could be two- or three-thousand kilometres away from home and seeing places that would simply have been impractical when pitching a tent and man handling everything in and out of the car every time you set up camp. And all this capacity for convenience began to breed ideas of opulence, the potential to start adding features large and small that began to lift camping out of its spartan past and into the realms of the portable resort. How we laughed when we first heard of space heaters being fitted to camper trailers! What a crock! How crazy was that? Surely it would be like trying to warm an ice cube in a refrigerator. It was ludicrous, but it worked, and the first time you got to sit inside a heated camper on a bitterly cold winter’s day as the rain drizzled down outside you knew you just had to have one of those in your camper. And so it went with a string of creature comforts that just seemed to roll out of the workshops and the manufacturers’ willingness to value add to their products: reading lights for the bed, LED light strips in the ceiling, space heaters, hot water systems, televisions, sound systems, box-spring mattresses, internal as well as external kitchens, internal dinettes, internal shower en suites, 240-volt as well as 12-volt circuits, refrigerators, complex and sophisticated electrical set-ups and management systems, wardrobes and cupboards, insulation and, with the advent of lithium batteries, even air conditioning. Could this really be called camping? The old line about 'glamping' seemed to echo in the background, but it was still portable, there was still the external awning, the external kitchen with all its accoutrements and it all came with that same mindset that encouraged an outside living experience as the main theme of the lifestyle. Nobody was disappearing inside to turn on the TV and fire up the microwave at the first sign of sunset, people still gathered around the campfire at every opportunity and days were still spent walking along the beach, climbing that nearby hill or seeing the local town's sights. 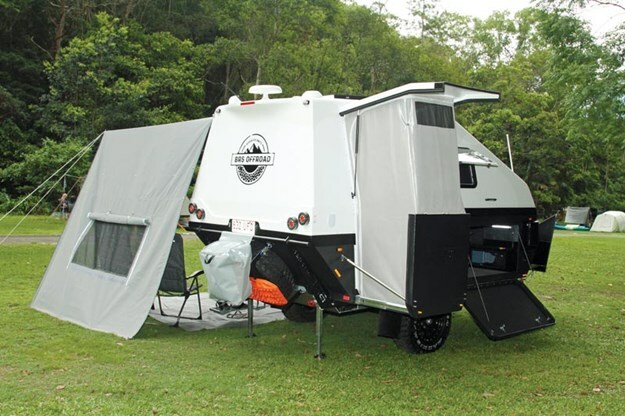 Camper trailers have come a long way in the past two decades, not just in their external appearance but also in their capacity to open up all seasons and all weather conditions for recreational travel. They extend those same advances in mobility that have made such a huge difference to the way we access this nation. Believe it or not, most campers were once built without any form of electrical fit-out. Today such campers are a rarity. These days we have lithium batteries and multi-deep cycle battery systems, sustained by solar arrays in combinations of fixed panels – frequently of thin film technology – and portable panels or lightweight and fold-up solar blankets. Sometimes a fuel cell is chosen as a source of power without the noise of a generator for those days when the sun just isn’t cooperating or demand exceeds its capacity to sustain the reserves. When in motion we have DC-DC chargers to top-up the batteries, and battery management systems to ensure we can stay in touch with our reserves. What has all this got to do with interior comfort in a camper? It means that now we can provide for much more complex electrical fit-outs to keeps our banks of lights going, charge our phones, cameras and laptops, plug in a wide array of portable appliances, fire up our diesel heaters and keep the fridge buzzing away to keep our beers cold and our food fresh. Now our camper is a cosy retreat from the vagaries of the real world outside. Now we can have a portable office that keeps us in touch with our business, or simply somewhere to sit in comfort while reading, or enjoying a meal. 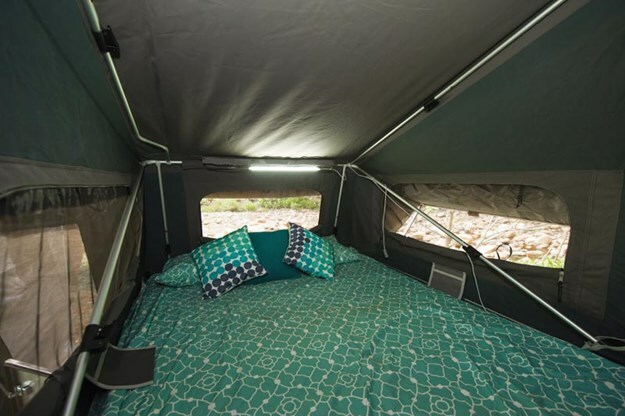 The development of the LED has had a big effect on the liveability of our camper interiors, most especially in its later iterations where output is better, workable dimmers are available at a reasonable cost, colour temperature makes them less stark and we can adjust for insect resistance at the flick of a switch. In the bad old days portable lighting relied on tungsten globes or halogens that ate electricity and could get hot enough to burn your skin or material, or expensive fluorescent lights that did the job but required fresh batteries all too often and were heavy and bulky. LEDs consume a tiny amount of power, and thanks to their efficiency, converting almost every milliamp of power consumed to light rather than to creating heat, they can be brighter at the same time. This gives us soft “mood” lighting if we want it, or bright flooding light if that’s necessary. They last for many thousands of hours of use, will survive rough handling and weigh next to nothing. When it’s cold outside we are no longer necessarily climbing into cold sheets and waiting while our overloaded metabolisms generate enough body heat for us to be comfortable. We’re not advocating electric blankets – though you can get 12-volt versions – but step into the camper half an hour before bed time and flip the switch on the space heater and by the time you’ve polished off that last half-glass of red, said your goodnights, cleaned your teeth and packed away the chairs, you can step into the comforting warmth of your camper interior to take your time getting into your pyjamas and sliding into a bed that’s absorbed plenty of ambient heat. Flip the heater onto low and the camper will stay toasty warm all night. 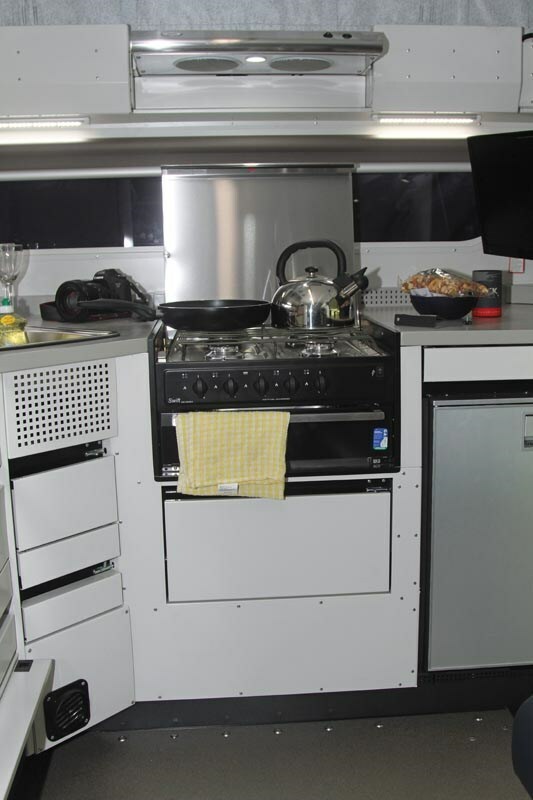 Many hybrid campers today offer internal kitchens as an option, or even as standard equipment, while virtually all provide an internal bench, and most have a sink. 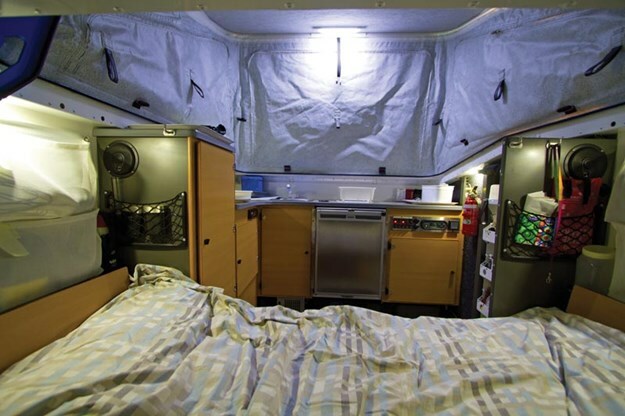 Many don’t provide for internal cooking, as this legally requires them to have venting to the exterior, which has the potential to leave your camper open to dust. Cooking can also leave the interior of your camper, including the bedding and your clothes, smelling of last night’s stew. However, there are meals you can cook without creating any such problems. Toast and scrambled, poached or boiled eggs in the morning, or warming cereals such as porridge shouldn’t be an issue, as long as you don’t burn anything, and that internal bench can help prepare sandwiches for lunch and similarly simple meals for dinner. 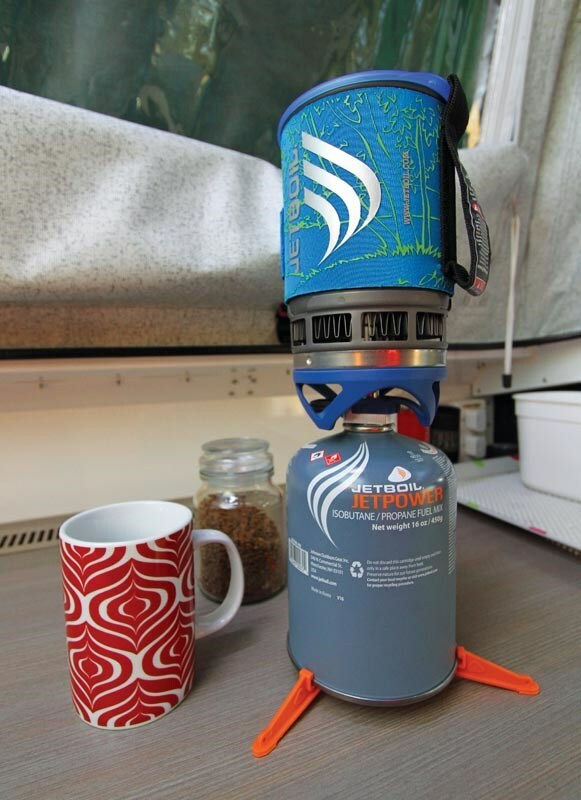 A handy addition to any camper’s gear is a small camp stove. There are the ubiquitous single burner gas cookers that run off gas cartridges and sell for around $20 apiece, but even handier are the small hiking cookers, which are much smaller and lighter. These run off small gas cartridges, are very efficient, can heat water for coffee or tea in just a short time and even enable you to prepare basic meals with a little thought. Prices can be $100 and up to $250, depending on brand or model, but they can be well worth the investment. An indoor sink can also make life more comfortable on those cold, wet evenings when you need to brush your teeth or wash your hands. With the space heater humming away it’s just nice to stay inside. Internal access to a fridge also makes for a quick and easy set-up when you come to pitching camp in wet weather. Sometimes you can’t avoid it, but if you have to do it then you don’t want to be running around in a downpour trying to put up an awning, just so you can get to the milk and eggs. 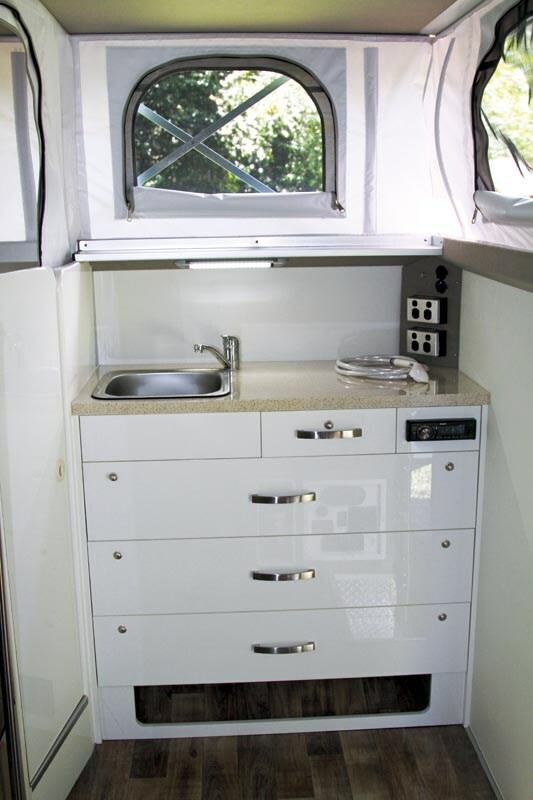 An internal ensuite has become a must-have for many campers. As those who have already bought into camper trailers have found, there’s a convenience factor here that speaks volumes and overrides all the penalties, such as cost, weight and size. Internal en suites have also become a major factor in the sale of caravans, but in camper trailers the location of the facilities presents a significantly greater problem because campers are generally smaller and lighter. 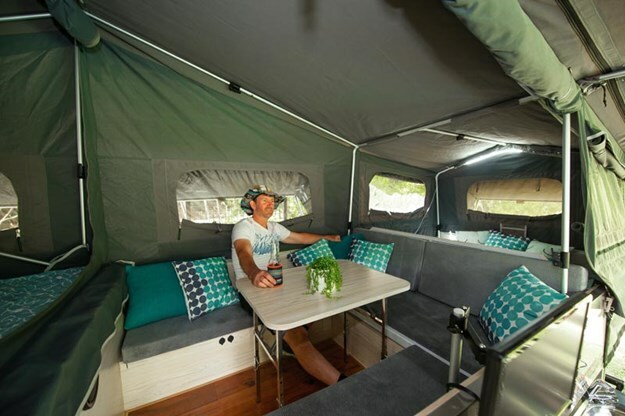 Many have tried to adapt with external add-ons, as these can be even roomier and more comfortable, and where they have direct access into the camper interior they are often deemed acceptable. This is most especially true for the ladies, who are usually just a little less tolerant – and for good reason – of the go-anywhere/great-outdoors-as-a-toilet approach, and are fed up with the run from shower tent to camper with just a towel wrapped around themselves. 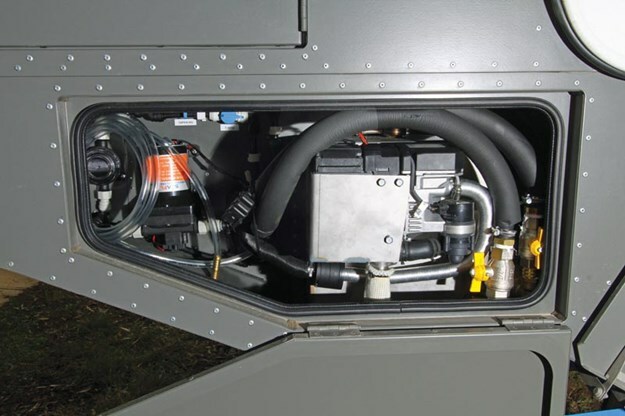 There are camper manufacturers, mostly in the hybrid category, that have built strong market support by their rapid adoption of the internal en suite feature. This usually means much larger water capacity, additional plumbing, either gas or diesel heating facilities (the latter requiring bigger or more bottles) and sturdy construction to carry all this weight. 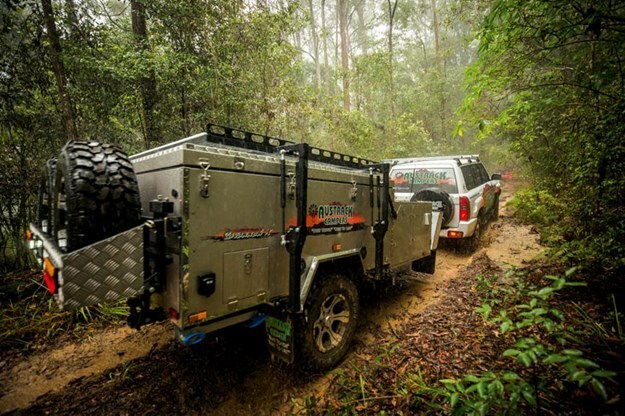 It usually means pushing gross weights over the 2000kg mark, the then-necessary breakaway brake systems, increased fuel consumption, reduced access to difficult camping areas and maybe even an upgrade in tow vehicle capacity. However, in spite of all these downsides, it’s become a major selling factor for many, and a great new wrinkle on the mobile comfort theme. Your camper’s interior is more than just a soulless place to retreat when it rains. You can still have the active outdoor experience, but thanks to technology and the industry’s willingness to experiment, expand and explore we now have a semi-resort style home-away-from-home with more than enough comforts to satisfy the most ardent five-star traveller. Camping can be as basic or as luxurious as your desires in the 21st Century – why wouldn’t you want to be actively on the road all year-round?